After all the water news from Michigan, it is disappointing that our Capital City is still a huge polluter of the Grand River. I am confused about the statement that most pollution occurs between the damns. Does the storm drain go the treatment plant first then overflows in the river? Isn't the treatment plant outfall past both damns? I see two large "drain outfalls" right next to GM on the west bank but I have been thinking that at least those two are draining underground or covered over streams. The water that flows from them looks clean and the volume does not grow after a storm. So where is the stormwater entering the river is my question? Maybe building a huge overflow/cistern/pond to catch the stormwater before it floods the treatment system would be an answer. Then slowly empty and treat the stormwater. Sorry to bring permeable pavement again:} but it can dramatically reduce the amount of rainwater going into the storm drains and sewer system. All water is intercepted first; there is not capacity for it all be sent to the wastewater treatment plant. As the article says, this system is located between the two dams, largely, because it's the oldest area of the city. Most of the newer parts of the city were built with seperated wastewater and stormwater sewers, which greatly reduces overflows during a storm. Does anyone know if they have a list of what neighborhoods have already been separated out? The end of the article stated they were working on the Moores Park Neighborhood, but I had wondered what parts of East/West Side and Downtown had been completed. I found this, page 11 of the PDF has a map that seems to show the areas that need to be separated, but it seems like they would need to separate out more then what is shown. Maybe it is getting updated as they complete more areas. I take from this information that the stormwater is going into the river directly, I just have not noticed the points where these drains enter the river downtown. I have noted where the Frandor drain gushes up and enters the Red Cedar just south of the Kalamazoo St. Bridge by E.L. so I guess these drains may be under the water's surface. A truly clean river flowing through our city could be such a great asset and benefit the people of Lansing so much that I think a greater effort to separate the drains and keeping all pollution out of our rivers would be well worth the cost. It is a different situation in a thousand ways but some cities like Bern the Capital City of Switzerland have a clean river that people swim in and float down every day in the summer. It would be so cool if one could tube or swim down our rivers at lunchtime like in Bern. I agree. Austin, Texas has a huge swimming pool in part of their river that is free to swim in and open year round. The water is great and very clean. You can see right to the bottom. 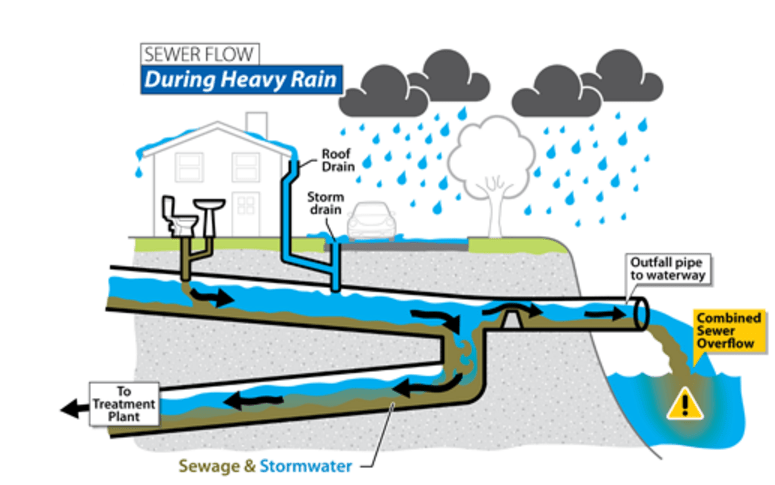 Combined Sewer Systems serve approximately one quarter of the U.S. population. 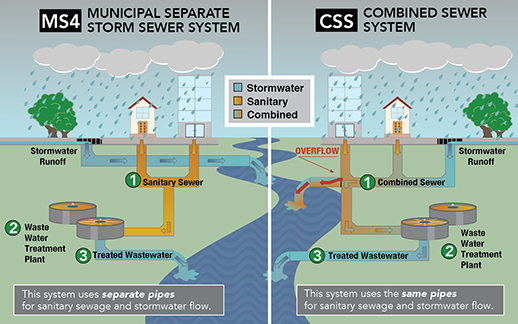 Stemming from increasing patterns of large weather events, combined sewer overflows (CSO) result in nearly 850 billion gallons of untreated waste and storm water annually. Climate models predict a significant rise in heavy precipitation events across the U.S., particularly in the Northeast and Midwest, where a push towards implementation of long term CSO control plans are on the rise. CSSs serve approximately 860 communities with a total population of about 40 million people. Most communities with CSOs are located in the Northeast and Great Lakes regions, particularly in Illinois, Indiana, Maine, Michigan, New York, Ohio, Pennsylvania, and West Virginia. Although large cities like New York, Philadelphia, and Atlanta have CSSs, most communities with CSO problems have fewer than 10,000 people. Developed countries such as the United States, Canada, most Western European nations (e.g. Italy and France), Australia, Singapore, South Korea and Japan are struggling with public health problems of SSO prevention. As is usually the issue in this country, however, it's that this is a national problem in scale, and one that came to notice upon the creation of the EPA with associated mandates, but it's never been funded at the scale of the problem. The problem is bigger than most cities could ever hope to correct with their own funding - even relatively wealthy ones. The EPA offers low-interest loans, but not enough of them, of course, and state governments aren't paying for them because we've been living on the idea of austerity in most areas of the country. Since 2004, Winnipeg's antiquated combined sewer system has dumped at least 185 million litres of untreated raw sewage into the city's waterways, and it could cost the city up to $4 billion to fix the problem. A CBC News analysis of incident reports going back to 2004 revealed that at least 73 million litres of raw sewage has flowed into the Red, Assiniboine and Seine rivers due to system and mechanical failures. That doesn't include the deluge of rain and snow that can overwhelm the system — the city says storms can add 10 million more litres of raw sewage every year into the rivers. Anyway, rant over. I advocate for what Lansing has been doing since they'd stopped and restarted the project, and that's both treatment plant upgrades (I hope this includes capacity increases/expansion) and sewer seperation. I bet we wouldn't need to increase capacity or expand treatment if we finished the sewer separation project. The stormwater amounts are huge, and diverting that away from treatment facilities would be a giant reduction in the amount of sewage that needs to be treated. Yes, but tearing up the streets is more expensive and takes longer, which is why the city has cancelled that plan before restarting it. I like "all of the above" approach. They are talking past 2030 before they could finish CSO projects, whereas you could expand the treatment plant in a year or two, I'm thinking. You'd have to pay more up front, but it's a helluva lot cheaper than a decade's long sewer CSO program in the long-run. And this is why we need to redirect much of the government funding towards infrastructure improvements, away from foreign wars. I am hoping that the US and Michigan governments will finally come to the understanding that infrastructure development is one of the most important things that the government does. Private companies don't build sewers and airports on their own. I hear the "r" guys at the Capitol saying the gas tax hike is dead in the water. Their constitutes cannot afford it. This is exactly how we find ourselves with streets and sewers failing. I had to take my cat for his shots down East Mt. Hope yesterday and there are parts of the road there that can no longer be considered paved. I spent hundreds of dollars on car repairs in the last two years, I would really rather give that money to fix the roads through a gas tax which is really a user tax. These days the price of gas goes up and down that much regularly, what's the big deal? It is just an automatic reaction to the word tax. Do these guys float over the Lansing streets to get to the Capitol? They really shoud be ashamed of their governance, those streets are a sign of that failure. They still are looking the other way while we dump raw sewage into our most precious resource. Michigan has to be all about the water!